Siquijor ( Cebuano: , Tagalog: ) is an island province of the Philippines located in the Central Visayas region. Its capital is the municipality also named Siquijor. To the northwest of Siquijor are Cebu and Negros, to the northeast is Bohol and to the south, across the Bohol Sea, is the island of Mindanao. During the Spanish colonial period of the Philippines, the Spaniards called the island Island of Fire (Spanish: ). Siquijor is commonly associated with mystic traditions that the islands growing tourism industry capitalizes on. Siquijor is an island province in the Visayas. It lies southeast from Cebu and Negros across Cebu Strait (in some references called Bohol Strait) and southwest from Bohol. Panglao Island which is part of Bohol province has a similar composition of the soil which is found throughout the whole island of Siquijor. Bohol is also located north of Mindanao separated by the Bohol Sea. The island lies about 19 kilometres (12 mi) east of the nearest point on southern Negros, 25 kilometres (16 mi) southeast of Cebu, 30 kilometres (19 mi) southwest of Bohol, and 45 kilometres (28 mi) north of Zamboanga Peninsula of Mindanao. It is predominantly hilly and in many places the hills reach the sea, producing precipitous cliffs. At the center, Mount Malabahoc (locally known as Mount Bandilaan) reaches about 628 metres (2,060 ft) in elevation, the highest point on the island. Three marine terraces can be roughly traced especially in the vicinity of Tag-ibo on the southwestern part of the island, a barrio of San Juan municipality from the seacoast up into the central part. Siquijor is a coralline island, and fossils of the giant clam tridacna are often encountered in the plowed inland fields. On the hilltops there are numerous shells of the molluscan species presently living in the seas around the island. Siquijor was probably formed quite recently, geologically speaking. The ocean depths between Siquijor and Bohol and Mindanao are in the neighborhood of 640 metres (350 fathoms; 2,100 feet). 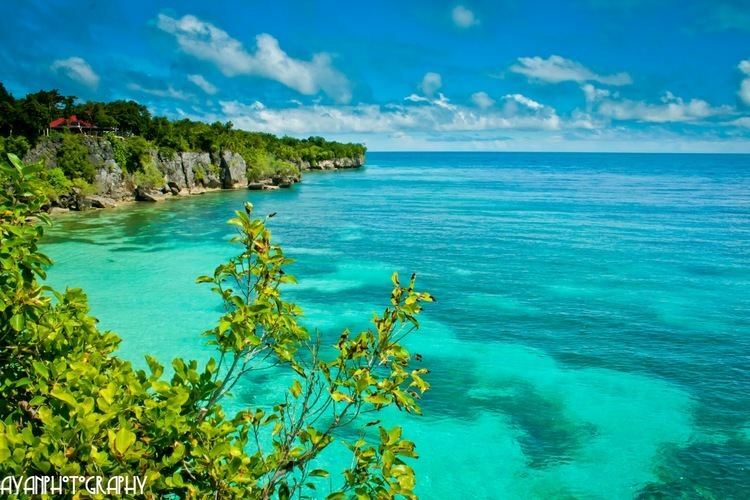 With a land area of 338.5 square kilometres (130.7 sq mi) and a coastline 102 kilometres (63 mi) long, Siquijor is the 3rd smallest province of the Philippines. 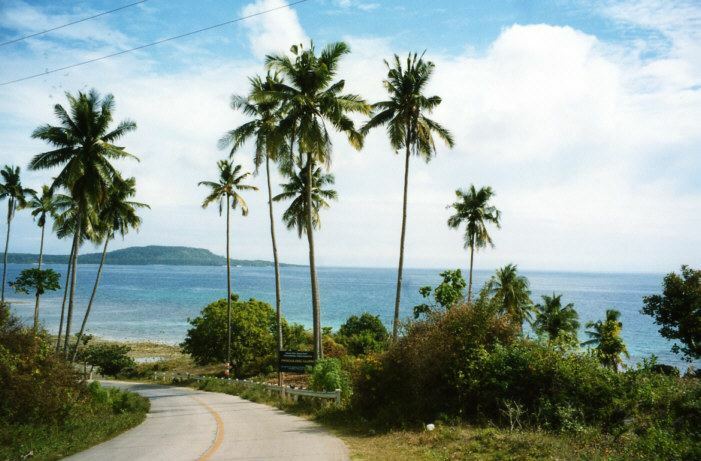 The climate in Siquijor, like most of the Philippines, is tropical. It is dry from January to May and wet the rest of the year. Annual rainfall is 1000 to 1300 millimeters with November having the heaviest rainfall and April having the least. 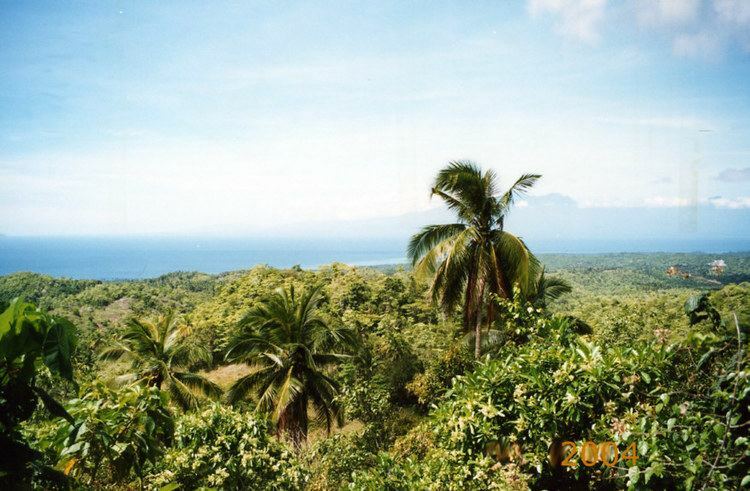 Siquijor has an average temperature of 28 °C (82 °F) and a humidity of 78%. The island was first sighted by the Spaniards in 1565 during Miguel López de Legazpis expedition. The Spaniards called the island Isla del Fuego or "Island of Fire", because the island gave off an eerie glow, which came from the great swarms of fireflies that gathered in the numerous molave trees on the island. Esteban Rodriguez of the Legazpi Expedition in 1565 led the first Spaniards to "discover" the island. He was captain of a small party that left Legazpis camp in Bohol to explore the nearby islands which are now called Pamilican, Siquijor, and Negros. Founded in 1783 under the administration of secular clergymen, Siquijor became the first municipality as well as the first parish to be established on the island. Siquijor was, from the beginning, administered by the diocese of Cebu. As for civil administration, Siquijor was under Bohol since the province had its own governor. The first Augustinian recollect priest, Father Vicente Garcia, arrived in Siquijor in 1794. Several years thereafter, a priest of the same order founded the parishes of Larena (initially called Can-oan), Lazi (formerly Tigbawan), San Juan (Makalipay), and Maria (Cang-meniao). With the exception of Enrique Villanueva, all of the present six municipalities were established as parishes in 1877. From 1854 to 1892, Siqiujor became part of the province of Negros Oriental, and became a sub-province in 1901. At the turn of the century, Spanish sovereignty in the Philippines came to an end and at the Treaty of Paris in 1898, Spain ceded the Philippines to the United States. Siquijor island felt the presence of American rule when a unit of the American Cavalry Division came and stayed for sometime. The American Military Governor in Manila appointed James Fugate, a scout with the California Volunteers of the U.S. Infantry, to oversee and to implement the organization and development programs in Siquijor Island. Governor Fugate stayed for 16 years as lieutenant governor of Siquijor. While it was not at the center of military action, Siquijor was not spared by World War II. Japanese detachments occupied the island between 1942 and 1943. The Japanese announced their arrival to the island with heavy shelling. On November 10, 1942, Japanese warships started shelling Lazi from Cang-abas Point. In Lazi, a garrison was established in the old Home Economics Building of the Central School. Philippine guerrillas engaged in sabotage and the interaction during this time to cause havoc on the Japanese lives and properties. During this period, Siquijor was briefly governed by Shunzo Suzuki, a Japanese civilian appointed by the Imperial Japanese Forces until he was assassinated in October 1942 by the guerrilla forces led by Iluminado Jumawanin, of Caipilan, Siquijor. Mamor Fukuda took control of Siquijor from June 1943 until the Japanese forces abandoned the island when the liberation forces came in 1944. At the outbreak of World War II, Siquijor, then a sub-province of Negros Oriental, was headed by Lieutenant Governor Nicolas Parami. Refusing to pledge allegiance to the Japanese Imperial Forces, Lt. Governor Parami was taken by Japanese soldiers from his residence at Poo, Lazi one evening and brought to the military headquarters in Larena. He was never heard from again. In 1943, the Japanese puppet government appointed Sebastian Monera of San Juan governor of Siquijor. His administration however was cut short when he was executed presumably by Filipino guerrillas operating in the mountains of Siquijor. On September 30, 1943, the United States submarine USS Bowfin SS-287 delivered supplies to the people of Siquijor and evacuated people from the island. On February 21, 1945, the destroyer USS Renshaw (DD-499), part of Task Unit 78. 7. 6, was escorting a convoy of about 50 various Landing Ship types (LSTs, LSMs, LCTs) with 12 other escorts. At 1059, Renshaws lookouts sighted a torpedo wake, then a submarines periscope and part of a conning tower. The Renshaw was attacked by a Japanese Imperial midget submarine off the coast of Siquijor, which caused extensive damage to the ship and killed nineteen of the crew. United States WW2 B-17 pilot Captain Stanley M. Sabihon was born on Siquijor and later raised in Hawaii. He commanded a nine-man B-17 crew in 51 missions over Europe, tallying 280 combat hours, and was the first naturalized citizen from the Philippines to achieve an officers rank in the U.S. Army Air Corps. In mid-1945, local Filipino soldiers and officers under the 7th, 71st, 75th and 76th Infantry Division of the Philippine Commonwealth Army arrived and liberated the islands of Siquijor alongside the recognized guerrilla fighter groups. Both groups fought side by side against the Japanese Imperial forces at the end of World War II. On September 17, 1971, Siquijor became an independent province by virtue of Republic Act No. 6398. The capital, formerly Larena, was transferred to the municipality of Siquijor in 1972 with Proclamation No. 1075. Siquijors long-time reputation as a place of magic and sorcery both attracts visitors and keeps them away. Siquijor is also well known for its festivals that focus on healing rituals where incantations are sung while the old folks make potions out of herbs, roots, insects and tree barks. In hushed talks, locals would share a story or two about folk legends pointing to the existence of witchcraft and witches in the island. Among the many attractions are the beaches, caves, waterfalls, Bandilaan Natural Park, and butterfly sanctuary. White sand beaches make up most of the 102-kilometer coastline of Siquijor. The coral reefs ringing the island offer some of the best diving in the Philippines for snorkelers and scuba divers. Dive courses are conducted by several dive operators on the island in version of PADI, CMAS and NAUI. Siquijor was declared a marine reserve in 1978. During 2007, data from the Philippine Department of Tourism showed that Siquijor posted the highest growth in visitor arrivals among the four provinces in region 7.